This is a remote wilderness area situated in north central British Columbia on the easterly fringe of the Skeena Mountains and on the southerly end of the Spatsizi Plateau, a division of the Stikine Plateau. The park boundary completely encloses the headwaters of the Firesteel River, whose waters eventually reach the Arctic Ocean about 3800 km away. A Letter of Permission is required for individuals or groups who wish to use horses within Tatlatui Provincial Park. To obtain a Letter of Permission, please contact the BC Parks Stikine Area Office at 250 771-4591. If there is no answer, please leave a detailed message stating your request for a letter of Permission, your name, contact information and the date you wish to visit the park. BC Parks will return the call as soon as possible. Hunting is permitted within Tatlatui Provincial Park. Please note that this park is in Region 7a. All hunting for big game is authorized through Limited Entry Hunting. Please refer to current BC Hunting Regulations. Only permitted air charter companies are authorized to fly into Tatlatui Provincial Park. Satellite communication devices are recommended when recreating in the backcountry. A communication device will allow you to alert others to an emergency situation or if you are overdue at your destination. This equipment is an essential part of your survival kit, and should be compatible with your activities and location. 240 km north of Smithers and approximately 180 km southeast of Hwy #37 at Eddontenajon Lake. No road access. All major lakes accessible by float plane. Other access alternatives would be horseback or helicopter. History: In June of 1824, Samuel Black and his crew arrived at Thutade Lake (pronounced Tootaddy) after a hard and dangerous journey up the Finlay River. 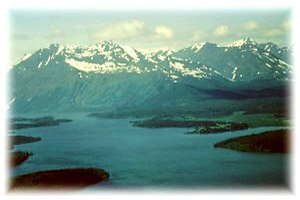 Thutade means “long, slender lake.” The first official surveys into the area were carried out by Frank Swannell and R.G. McConnell in 1913. Many of the park place names were taken from the names of early surveyors and explorers. Lord Kitchener, a well-known British military man, was honoured after his death in 1916 by having a lake named after him. Another name was derived from Athapaskan Indian dialect. Conservation: Boreal white and black spruce is found at the lowest elevations in the Firesteel Valley, also, Englemann spruce – subalpine fir. The alpine tundra is comprised of frost shattered rock, scree slopes, fine soils and large expanses of dwarfed plants. Wildlife: Mountain Caribou, moose, stone sheep, mountain goat, beaver, Arctic ground squirrels, grizzly bears and wolves can all be found here. There are angling opportunities for rainbow trout as well. There are good backpacking opportunities here. Trails may be followed in to several areas of interest, but are not marked or regularly maintained. It may be difficult to locate the starting point of some trails. For your own safety and the preservation of the park, obey posted signs and keep to designated trails. Shortcutting trails destroys plant life and soil structure. A Letter of Permission is required for individuals or groups who wish to use horses within Tatlatui Provincial Park. To obtain a Letter of Permission, please contact the BC Parks Stikine Area Office at 250 771-4591. If there is no answer, please leave a detailed message stating your request for a letter of Permission, your name, contact information and the date you wish to visit the park; BC Parks will return the call as soon as possible. Hunting is permitted within Tatlatui Provincial Park. All hunting for big game is authorized through Limited Entry Hunting. Please refer to current BC Hunting Regulations for seasons and bag limits. Note: Tatlatui Provincial Park is located in Region 7a. There is a cabin available for public use located at Kitchener Lake within Tatlatui Provincial Park. Users are responsible to clean cabin upon departure. Fires should be used sparingly, as they are among the most serious visual impacts in the backcountry. Always carry a stove; use it for most if not all of your cooking needs and only build a fire when it is safe and will not cause further damage or deplete wood supplies. While campfires are allowed and campfire rings are provided at each campsite, we encourage visitors to conserve wood and protect the environment by minimizing the use of fire and using campstoves instead. Please check for campfire bans and the Fire Danger Rating for the area you are visiting before igniting a fire in the backcountry. Limited burning hours or campfire bans may be implemented. To preserve vegetation and ground cover, please don’t gather firewood from the area around your campsite or elsewhere in the park (this is a ticketable offence under the Park Act). Dead wood is an important habitat element for many plants and animals and it adds organic matter to the soil. For more information on campfires in the backcountry, click here.